Gathering My Roses: Measure Up Bowls: Review & Giveaway -- CONTEST CLOSED! Measure Up Bowls: Review & Giveaway -- CONTEST CLOSED! Recently, I was blessed to discover and receive two Measure Up Bowls from Heather at Measure Up Bowls! These bowls are a true blessing to all of us that are watching our weight and utilizing portion control in our diets. I love mine. I use them daily -- no kidding. It's so easy to portion out my morning cereal (which is so easy to underestimate!) and milk. I use it for soup, stew, chili... fruit and my beloved Peach Mango Sherbet! I don't have to wash (or eat out of) the measuring cups now. You can't truly know just how much you're eating unless you measure everything -- and, let's face it, that's just not always possible. Who wants to stuff lasagna in a measuring cup and then toss it into a bowl or onto a plate? I don't. Now... I don't have to do that. Just put it into the Measure Up Bowl and it's good to go! From The Website: The Measure Up Bowls are a solution to portion control at every meal. The Classic is for soups, pastas, rice, cereal, chili, anything you eat out of a bowl. The pre-measured portions on the classic are 1/2 cup to 2 cups. 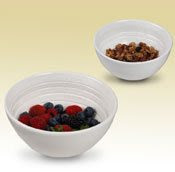 The small Measure Up Bowl is perfect for high fat, calorie dense foods such as chips, ice cream, nuts, and granola. These foods should be enjoyed in a smaller serving size. The pre-measured markings on the interior of the small Measure Up Bowl are 1/4 cup, 1/2 cup, and 3/4 of a cup. The measurements marked are perfect. They are clear and easy to read -- no guess work here! The bowls are made of microwave and dishwasher-safe porcelain. Easy to use and easy to clean up. Heather, the creator of the Measure Up Bowls, was an old hand at dieting. After the birth of her second child, she decided to change her lifestyle and drop the fad diets and the pounds she'd gained. In her own words: One morning while measuring out my cereal, I though this would be so much easier if the measurements for what I was eating was inside of the bowl I was eating out of. I wouldn't need to wash or store the measuring cups. It would eliminate a whole step. I looked for it and could not find it anywhere. So I started developing the Measure Up Bowl. That was over two years ago, and with hard work and the loving support of my family and friends I am proud to say the Measure Up Bowl is here! I am even prouder to say it took me about 11 months to lose 80 pounds and I have kept it off for over two years. I continue to experiment with different recipes, exercise routines, and fitness strategies. I am developing many other Measure Up healthy lifestyle tools such as a Measure Up Journal, a plastic children's Measure Up Bowl, and many other fun and exciting products soon to be announced. I have taken every step in this weight loss journey and sincerely hope my experiences and products help you no matter what your goals are. Heather also developed the The Measure Up Journal, a three-month portion control journal. It helps you track food and beverage intake and measures Calories, Fat, Protein and Carbs for each item. 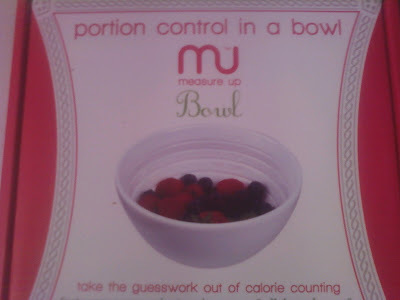 Use with your Measure Up Bowls as a great diet tool! We all know that journaling has been proven to aid in reaching fitness goals! Heather has graciously offered TWO of our readers a chance to win a Combination Set of Measure Up Bowls! Just follow the instructions below for your chance to win! or all other entries will be discarded. I have these entry rules in place for a reason. Thank you! Please leave a comment sharing your best dieting tip! 1. Follow @GeorgiaMist on Twitter -- leave your Twitter name for verification! 4. Tweet about this contest (no more than once daily, please!) then come back here and leave your Twitter status URL. @GeorgiaMist Win a Combination Set of Measure Up Bowls! Two Winners! PLS RT! 5. Post the link to this contest on your blog, Facebook, or MySpace page(s) and link back here! 6. Enter another contest on our blog and then come back and tell us which one. Target.com and send us a copy of the on-line receipt for *5* extra entries! I received a complimentary set of Measure Up Bowls for the purpose of review. I was under no obligation to review this item. I received no monetary compensation. The opinions expressed are based on my own use and experience with the items. My best dieting tip is eating my meals off of small plates. I fill up the smaller plate and realize that I am full and really did not need that larger plate. I am following Gathering My Roses PUBLICLY via Google Friend Connect. my best dieting tip is "out of site, out of mind" works great when you cant see the junk you want to eat. Actually, measuring portions is my best tip! But I'll also say don't drink your calories! Make sure all your calories are also adding fiber and nutrients to your diet, give up sodas! My best dieting tip is to drink a lot of homemade lemonade. Water doesn't do it for me because it doesn't have flavor. I make my lemonade using just water, fresh squeezed or bottled lemon juice and 1 packet of stevia. Before such an awesome bowl, my best tip is to get my diet started by eating Lean Cuisines or other prepackage meals to help with portion control until I can do it myself. Entered your WalMart gift card giveaway. If you want something not so good for you wait a half hour and see if you really want it. If yes, go ahead. The best diet tip that I have ever received is to drink a full glass of water 10 minutes before a meal. That way you are hydrating and filling and you do eat less and do not feel hungry. My best tip is to drink 100 ounces of water a day with lemon added and to eat every three hours. My best dieting tip is drinking lot's of water and crystal lite singles taste great. Using a salad/dessert plate instead of a dinner plate is helpful! I shop after a meal. That way I am not tempted to put YUMMIES in the trolley. My best diet tip is to empty out your cupboards of all the bad temptations before you even begin your diet. the best dieting tip I can offer is to drink plenty of water especially before eating a meal. My best dieting tip is to limit processed foods of all kinds and opt for fresh foods and whole grains. I do not deprive I just take a much smaller portion of what I would like to eat. Also when I have a sweet craving I have some frozen grapes. Sweet and cold and full of goodness. Also a lot of time when I think I am hungry I am actually thirsty so I make sure I have water with me. Best dieting tip ~ high fiber, lots of vegetables & low carbs! Thanks for sharing this great giveaway! I became a public follower of this blog. My best dieting tip is : be prepared. --> Have a lot of fresh and healthy food available in your fridge and pantry (steamed chicken breast, fruits, veggie sticks, air-popped corn, whole grain crackers), so that when hunger strikes, you don't reach for high calorie foods. I became a Twitter follower under @nadicherie. Dieting makes me crazy. I hate measuring, counting, watching everything I eat. So I try to use the smallest serving bowl or plate I have...that makes my portions LOOK larger, but keeps the amounts under control. I think these bowls are a great idea too. My best diet tip is moderation. Do not eliminate small treats. I have also entered the Olay Total Effects giveaway. Eat raw veggies! They have no points and you can dip them in Fat-Free Ranch dressing and 4 tablespoons of that is only 1 point! I've lost 29 pounds since the first of the year and snacking on these fills me up! My tip eat like a bird. eat often small meals snack, high protein, yummy food. Best diet tip? Hmmm. Cook from scratch. It always helps me to see exactly what is in all my meals. I try to keep lots of good snacks handy so I'm not tempted by garbage. I weigh everything I eat. ANd I use an online calorie journal along w/30 min. of exercise each day. I've lost 60 pounds this way! Use smaller plates and drink a glass of water before you eat. My dieting tip is to be aware of everything you put in your mouth. Sampling while cooking and filling up on sugary drinks adds calories that need to be counted also. I follow @GeorgiaMist on Twitter as suebaby05. I follow publicly via Google Friend Connect. FB Fan of Gathering My Roses. I entered the Misikko Professional Flat-IronGiveaway. Don't eat after dinner and eat dinner before 8 pm. My best dieting tip is not to diet; eat smaller portions of things you enjoy instead of depriving yourself of certain foods entirely. My best dieting tip is to eat raw. Raw veggies/fruits and those should be the only snacks you allow yourself! My tip is to keep lots of fruit and vegetables in bite size pieces in the fridge. These are perfect for snacking. Keeping a diet/food journal has really helped me. The best tip I can give is to be determined. You can buy all the right foods and have loads of intention to follow through but if you are not determined in your own mind a diet wont last long. I am following on Google. My best dieting tip is to drink lots of ice cold water. You burn calories just warming the water up in your body, and you help to flush your system. Also entered in your $10 walmart GC for Olay. my best dieting tip is to eat breakfast. Youll burn more calories throughout the day! My best dieting tip is eating lots of fruits and veggies - since I had a big garden last summer, not only did I get some exercise, but also delicious fresh food! My best dieting tip is only purchase healthy items. Skip the junk food. If you don't buy it, it won't be in your house and you won't be tempted by it. Make a list with healthy good for you food and stick to it! I am following on Google Friend Connect. My best dieting tip is to eat only when you're actually showing physical signs of hunger - and then put your fork down between bites to help you know when you're full. Portion control! And these bowls will help. I really need control over chips - taking 10 chips from the bag and closing the bag has not worked. Also, try to make the 'good for you' food look as tempting as possible. No (or minimal) carbs after 3pm for me. Also I generally count my calories and only snack on veggies and fruits. So healthy! My best diet tip is to keep a journal: food, water, exercise, feelings, etc. It will make you more accountable to yourself! I have never been able to diet successfully so I don't have any tips. Mine is to drink a full glass of water before meals to fill up!! Thanks for the chance. My best dieting tip that has worked for me is to not eat after 7:30pm. These bowls are such a great idea! My dieting tip is to eat LOTS of fresh fruits, steamed veggies, and as many whole foods as possible. I also entered the Pillsbury Sweet Rolls giveaway. My best dieting tip is to read the labels on the food you buy. Try to select those low in trans fat. My best diet tip is to keep plenty of fruits and veggies on hand so you won't snack on junk. Thanks! I drink a glass of water about 15 minutes before I eat. we also east off smaller plates and bowls. If we do think we want second we either have to wait 15 minutes or until the kitchen is cleaned up. Eating organic works really well because organic food makes you full faster! My best dieting tip- only eat when you are hungry and always drink a glass of water 30 minutes ahead of time. My best dieting tip is to exercise and reduce your portions. I use a salad plate for dinner to keep from over eating close to bed time. I follow georgiamist on twitter @Aerated. Portion control and lots of water always works for me. It seems obvious but my best dieting tip is to not buy junk foods. If you don't bring that type of food into the house, you can't eat it. Also I try to drink more water throughout the day and that helps me feel less hungry. I publically follow your blog as degood with google friend connect. My best tip is to write down everything you eat. That kind of consciousness is really effecting in limiting what goes in the mouth. Thank you for the giveaway! My best dieting tip is to pre-prepare meals for the week that fit the proper portion size. Thanks! My best dieting tip is to get the junk out of the house! Bring in fresh fruits and salad fixin's. Freeze grapes! They are very slow to eat and all that chewing makes you feel fuller. My best dieting tip is using the Negative Calorie diet. I keep fresh fruits and vegetables, already cut up, in the fridge. My best tip is eating a huge portion of veggies before lunch and dinner. That way I fill up on the good stuff before the bad and am fuller quicker. My best dieting tip is to only fix enough food for the correct portions... if their is food left in the pan I have a tendency to eat it while cleaning up the kitchen. Eat breakfast, it will get your metabolism going earlier! Eating at home is my best dieting tip. Eating out adds tons of calories. My best tip for a healthy diet is to keep healthy foods stocked and easily accessible - on the counter, in the front of the fridge, etc. My best tip is that if you buy a larger bag or boxed item, take baggies and measure out portions in each one. That way when you want some, you just grab a baggie full and that is all you have. My best diet tip is to fill 3/4 of your plate with vegetables & fruits. My tip is to clean out your fridge and pantry with all that fattening food. I have lots of fruit and veggies now. Drinking lots of water is good for dieting also. I tend to eat whats in front of me, so I make my families plates in the kitchen and bring them to the table. That way when I am finished what is on my plate I am not picking at more when I am not still hungry. If I am truly still hungry I can go into the kitchen to get more. My diet tip would be to have a little treat occasionally, otherwise, I would get burned out. Best diet tip - eat food high in fiber and protein, but not a lot of meat. You feel fuller longer!